WEST PALM BEACH, Fla. (Oct. 6, 2017) - The International Hot Rod Association (IHRA) and Summit Racing Equipment have entered into a multi-year agreement to extend one of the longest running and most successful partnerships in motorsports history. Summit will continue as series sponsor of the popular Summit SuperSeries, which will enter its 17th season in 2018. The Summit SuperSeries is held at nearly 100 IHRA-sanctioned tracks throughout North America with more than 8,000 racers competing in the program annually. This season, IHRA Sportsman racers earned points at their local tracks for an opportunity to compete in the $200,000 IHRA Summit SuperSeries World Finals, Oct. 20-21 at Memphis International Raceway. There, track champions from participating IHRA tracks will race in Top ET, Mod ET and Junior Dragster divisions against the best Sportsman drivers from North America. "The Sportsman racer, at every level, has been and will continue to be one of the most important components of the Summit Racing Equipment family," Summit Motorsports and Events Manager Jim Greenleaf said. "We are proud to support the men, women and kids who gather at their local IHRA tracks to participate in the Summit SuperSeries. It is a great feeling for us to see champions from all over North America show up at Memphis for the Summit World Finals to race head-to head for an IHRA World Championship. "It takes the entire family of racers, member tracks, and support staff working together with Summit Racing Equipment to move the Sportsman racing component of IHRA Drag Racing to the incredible level of support and enthusiasm we have today. We are proud to continue our efforts in this successful program." "The partnership between the IHRA and Summit Racing Equipment goes back two decades," IHRA Vice President Skooter Peaco added. "They are a part of the IHRA family and we're thrilled for their continued support of our Sportsman racing programs. 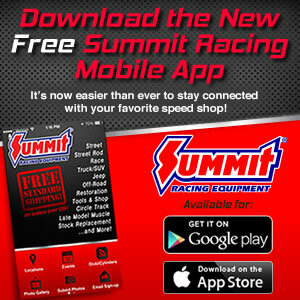 Our Sportsman racers are the backbone of our company and Summit continues to help us grow that program." Headquartered in West Palm Beach, Florida, the International Hot Rod Association (IHRA) is one of the world's largest motorsports sanctioning bodies. The IHRA promotes Sportsman drag racing for drivers of all levels. The IHRA sanctions nearly 100 motorsport facilities in the United States, Canada, Australia, New Zealand and Bahamas and welcomes 80,000 racers annually to their IHRA-sanctioned facilities.